Life on the earth is sustained due to presence of Luminaries in our Solar System- almighty Sun and peaceful cool Moon. Sun governs Soul and Moon rules emotions and feelings. There would be no life on earth without these two luminaries. 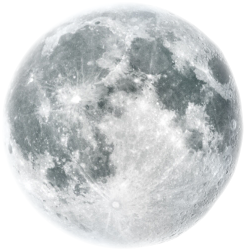 Astrologically speaking, Moon denotes mental and emotional power in human beings. She is Mann (feelings) which plays very important role in the life of human beings in maintaining stable relations with each others. Here, in this article, I shall try to highlight the astrological role Moon plays in the life of human beings. Moon is considered Queen of the Solar System. According to Vedic System of Astrology, Moon is a natural benefic and is capable of giving great mental power and prosperity. Prosperity in life is directly linked with the combined positions of Moon with Jupiter or other benefic planets in a horoscope. Jupiter signifies wealth. The combination of these two planets is specially considered very auspicious for wealth and prosperity. Moon is considered tender by nature and represents love and beauty. Poets have written lot on the beauty of Moon and have compared the beauty of woman with Moon in their poems. Moon has been a favorable subject for the scientist too. Though Moon is smallest among planets but due to its closeness with the Earth, she has enormous effect on the human beings on the earth. It has direct affect on females. The menstrual periods are governed by the movement and difference phases of Moon. The Sun and Moon are considered the two eyes of the universe. The Moon is so important and auspicious in Hindu mythology that women break their fast after having a look at Moon in the night. Some special fasts are directly related to Moon. In Vedic Astrology, Moon has been considered as having the power of ascendant and extraordinary importance is given by preparing separate natal chart using Moon as Ascendant. Major and sub period in Hindu astrology are based on the Moon nakshatras. Water is element of Moon. Gravitational force of Moon and Sun causes tides in the Oceans. Moon has no light of its own. She reflects the sun light on earth. Moon represents mother as she nourishes the life on earth as a mother. Positive Moon indicates joy, enthusiasm and peace of mind in life while negative or afflicted moon causes tensions, depression, suicidal tendency and pessimistic attitude. The Moon is like the window we are looking through. Whatever affects the Moon, deeply affects our heart and emotions. She has been allotted number 2 in numerology.